Our CC group recently celebrated the birthday of Jesus together by having a Christmas party and then caroling at a local assisted-living facility. It was the sweetest thing ever! First, we met together to make some gifts and cards for the elderly residents. We had a lot of families out with sicknesses; I hope you get well soon, friends! Our fab director, Mary Ann, directed the program, which included Scripture readings, Christmas carols, and . . . wait for it . . . a tin whistle song! Gasp! We had a great time, and I'm really not sure who enjoyed it more, the children or the residents. I'm very blessed and thankful to be a part of this awesome group! Your turn! Does your homeschool group get together for a Christmas party or service project? What do you do? I'd love to hear how you celebrate this special time! 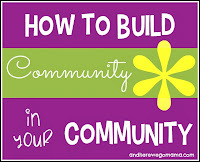 For more ideas on building community in your community, please click here!